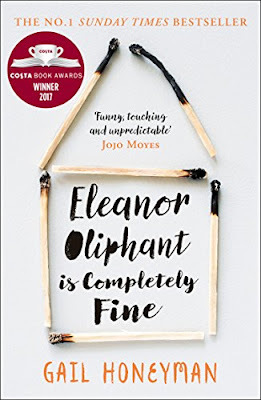 "Eleanor Oliphant is Completely Fine" by Gail Honeyman is a very readable novel. It is easy to turn the 383 pages as we delve into the damaged life of an improbable heroine. Eleanor is lonely and awkward, haunted by the ghosts of her past but at a basic level she is able to function in society. She has a job and a flat and at weekends she treats herself to bottles of vodka..
As you can see there are burnt matches on the novel's front cover. You may be able to guess why they are there. They speak of her past and those demons she has been unable to shake off. Eleanor has never had anyone she could call a friend until Raymond comes along. He is the computer troubleshooter in her workplace. They have lunches together and gradually she learns to trust him. Like his mother, he has simple kindness in his bones and he recognises Eleanor's pain. He wants to help her. 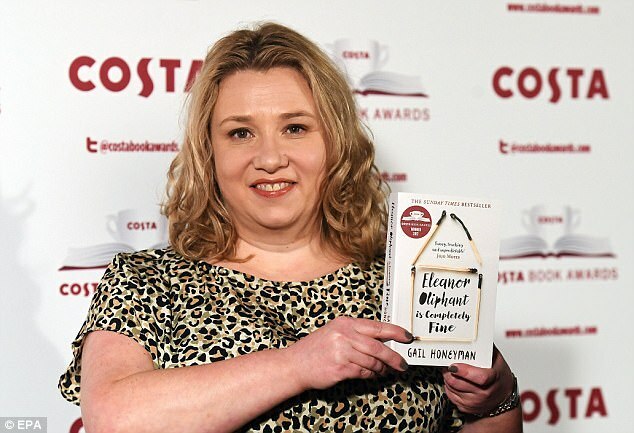 This was forty-something Gail Honeyman's very first novel but it has been met with rapturous enthusiasm and for several weeks earlier this year it was Britain's number one bestseller. Film rights have already been purchased by Reese Witherspoon and in the course of time Eleanor's story of survival and triumph will no doubt appear on the silver screen. Technically and artistically it is by no means the best book I have ever read. It has its flaws and its weaknesses but at its heart there is a damned good story. It is a story of loneliness in modern life, of the baggage we carry and of little acts of human kindness. Ultimately, the novel is uplifting and human. In the final analysis, we are optimistic about Eleanor's future. She has turned a massive corner. Well if it was a page turner , it certainly caught your attention. It has probably been read by far more women than men. That's okay. One must be open to other points of view. I think I've heard you say that before. It sounds similar to books I've read and enjoyed if I get them at a discount, but I'm too cheap to pay the original price! I do like books that have happy and optimistic endings at least every now and then. I shall watch for this at the book fair this fall. It's bound to turn up before the end of the year Jenny. I suspect but do not know for sure that you will enjoy this novel. I wonder if you will read it one day Lee? I have skipped this post because I'm reading the book at the moment. My daughter recommended it to me. I tried not to give away too much Sue. I read this a couple of weeks ago for book club and absolutely loved it. We haven't had the meeting for this book yet, so it will be interesting to see what the others thought of it. I shall be giving it one of my highest scores yet! Can't wait to see the film. I think there's a lot to talk about with this novel Frances. That will be ten hours of happy distraction. I only skimmed this review because I was afraid of coming across a spoiler, and I haven't yet read the book! But I'm glad to hear you found it likable and readable overall. I tried not to include any spoilers Steve. Interestingly this seems to be a book in everyone's hands and on their lips at the moment. It's even on my list! Don't expect Literature with a big L Graham! Well, as usual, I'm the odd one in the group. I've not heard of it, nor do I have any plans to read it...however I shall comment on it regardless, lol. The title in your post caught my eye as one of my ancestors had Oliphant as his middle name! There. I had something to say, at least! Hello Hilly. Oliphant was originally and most definitely a Scottish surname. The novel is set in Scotland though it is most Un-Scottish.